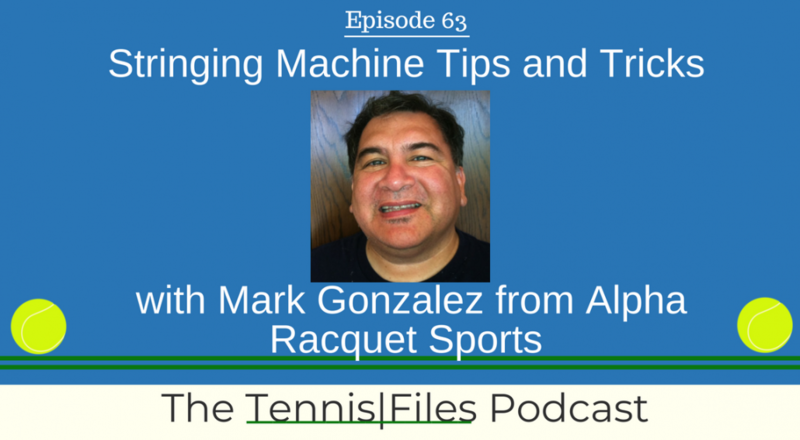 On today’s episode of The Tennis Files Podcast, I spoke with Mark Gonzalez from Alpha Racquet Sports about stringing machines. I asked Mark about the different types of stringing machines, how to choose the right one for you, and tips and tricks to become a great stringer. The International Alliance of Racquet Stringers (IART) has said that Mark’s knowledge of stringing machines ranks among the very best in the industry. Mark wears many hats in the tennis world; he is a Sales Manager for Alpha Racquet Sports, an industry consultant for IART, and a Yonex rep. Mark has a reputation for being super responsive and has helped me figure out my stringing machine needs. When I did research on best value stringing machines, Alpha was the brand that popped up more often than all the others in the forums and everywhere else, which is why I decided to bring Mark on the podcast. I hope you enjoy this episode of TFP with Mark, and let us know what you think in the comments below! [9:46] The stringing machines Mark has used throughout his tennis and stringing career? [14:30] When buying a stringing machine, do we plan for the short term or long term? i.e. space in apartment, stringing skill level, potential to string for others, etc. [15:47] What are the biggest mistakes people make when buying a stringing machine? [17:31] What are the different types of stringing machines? [20:42] The kind of machine Mark recommends for a player’s first machine, that plays 2-3 times a week and breaks strings once every 2-3 weeks? [21:55] The drop weight machine is the cheapest kind generally – why is that? [23:53] Who would you suggest a drop weight machine for? [25:47] Is an electric machine worth it, and if so, what type of players would you suggest get one? [27:58] 2 point vs 6 point machines – what does this mean, and does it matter? [34:55] What is the WISE electronic tensioner head and what type of benefit would we gain from getting one? Is it worth it? [49:46] Are there any new machines planned for Alpha in the near future, and how we can get an Alpha stringing machine if we are interested in one? If you enjoyed my interview with Mark, subscribe to The Tennis Files Podcast in iTunes or your favorite podcast app!